A big source of this problem is that many preachers have become engaged in a bidding war over who can give the cheapest assessment of sin. You turn the TV on typical Sunday morning, and all you hear is the "love gospel" that is devoid of any moral responsibility. This type of guidance can only lead to destruction. The only source of lasting truth is the Bible. Any rules that man makes are subject to change and revision. The Good Book is the only way for us to know where we stand in God's eyes. The Bible played an essential role in the creation of the United States, and it continues to provide the moral compass for our nation. As Andrew Jackson was dying, he looked at the family Bible and said to his doctor, "That book, Sir, is the rock on which our Republic rests." 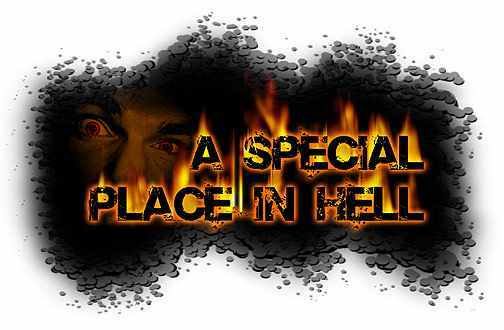 Hell was originally created as a place of judgment for Satan and those who followed him in their rebellion against God. The Bible says, "And the devil who deceived them, was cast into the lake of fire and brimstone where the beast and false prophet are. And they will be tormented day and night forever and ever" (Revelation 20:10). Someone once said, "If there isn't place called hell, God needs to create one for the evil people who deserve to be sent to such a place." Here are just a few examples of some people who have proven themselves worthy of such a dire punishment. I think the real factor at work here is man's rejection of his own sin disposition. Having to admit a fellow human is capable of being a monster proves that they share the same corrupt nature. People don't want to judge criminals because it reminds them of their own fate. The unwillingness to condemn evil makes us co-conspirators to their crimes. "Who knowing the judgment of God, that they which commit such things are worthy of death, not only do the same, but have pleasure in them that do them" (Rom. 1:32). In recent years, I’ve seen the use of some of the most outlandish excuses for why death row inmates should not be put to death. First the electric chair was deemed to be too cruel. I can't imagine someone with a sudden burst of 50,000 volts going through his body is going to yell, "Ouch!" Then lethal injection was attacked as a potential source of pain. I don't know how there is room for debate when one of the two drugs being administered places the person into a deep comma. Billionaire Ted Turner has a long history of venting his rejection of the Christian faith. He once boldly said, "I look forward to going to hell because I sure deserve it." Comedian and blabbermouth Kathy Griffin, in her fittingly named 'Straight to Hell' comedy special, talked about how she was certain that she will be one of the damned. "Oh I know I'm going to hell. I've got a hand basket all picked out. So don't bother e-mailing me to tell me I'm going to hell," she proudly proclaimed. Griffin then told her audience that they were going there too.